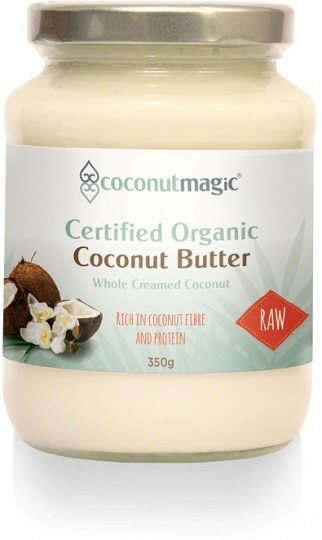 As rich and delicious as dairy butter but much healthier, Coconut Magic’s Organic Coconut Butter is made entirely from the meat of raw, organically grown coconuts. All that’s removed is the water (in a very gentle dehydration process), so the butter is bursting with pure, fresh coconut flavour and still full of the nutrients that make coconut such a healthy indulgence. Known for having healthy saturated fats great for their neuro-protective, immuno-supportive and antimicrobial properties. However, coconut meat is also a rich source of minerals important for the proper function of the musculoskeletal and circulatory systems, as well as heart-healthy dietary fibre. So how can you enjoy the great taste and the great health benefits? Well, it’s up to you – spread it like ordinary butter, add it to sauces and gravies, top desserts with it, stir it into your coffee or blend it into your smoothies – or just spoon it straight from the jar.